I don’t know how we got on the topic of body image but toward the end of a typical Monday night dinner at home, Brett and I started getting into a fairly emotional conversation about positive versus negative body image and having a healthy approach to fitness versus an unhealthy, shame-driven approach. I can’t blame him at all for not seeing my perspective from the beginning — I had not fully explained myself, nor had I provided any hard wired examples. Add to that the fact that Brett is a man who deals with completely different issues pertaining to physical appearance. I had initially given him the example of a student in my class who expressed to me she hates the way her thighs look in downward dog – a story that was all too familiar both from my own experience and from those who have shared similar sentiments with me! I told Brett how it broke my heart to hear that because ultimately my goal as a yoga teacher is to help people see their bodies in a more positive light. I felt like I was not doing my job. It wasn’t until he asked me in earnest “what’s wrong with not liking your thighs and doing something to change them?” I knew full well what he meant, and that he meant well. But I could no longer keep my cool, nor could I contain myself. I launched into a small section of my own story, a fairly recent incident that occurred during the last months of training for Ironman Lake Placid. On several occasions while preparing to head out for long runs I would stop and stare at myself in the mirror, I would lift up my shirt to uncover “the bulge” and force myself to see this imperfection and then take myself into a downward spiral of self-hatred. No longer did I feel motivated to run. What was the point if I looked like this? All I could focus on was the bulge that my run shorts created around my hips and that I had no way of covering this up, and how on earth will I cover this up on race day when I will be wearing tiny tri shorts and a tiny tri singlet that barely covers my belly button? As I was telling Brett this story my chin started to quiver and my eyes welled up with tears. Not only was I providing a concrete example of negative body image and body dismorphia, but I was reliving the experience and all the emotions that came with it. Brett was at the same time shocked that I could see myself in this way but, more importantly, appreciative that I could share this with him as it gave him a deeper understanding of who I am. And I in turn didn’t feel like I was harboring a deep dark secret. Eventually I was able to move beyond the thought process and my attention shifted away from obsessing over what was wrong with me. I was able to throw on my run clothes and just get out there because I had a much larger goal, something far more important to focus on; that goal was Ironman. It surprises me that I am able to unveil this story as I rarely talk about my own issues with body image, much less such isolated, specific incidents like this one. I normally keep these stories to myself because they make me feel shameful and embarrassed. At the moment I am working on putting all of this together into one big Maggie Story and this is really just a small snippet. But it’s an important one. This one incident shed light on what Ironman and endurance means to me. In the end, none of it matters. 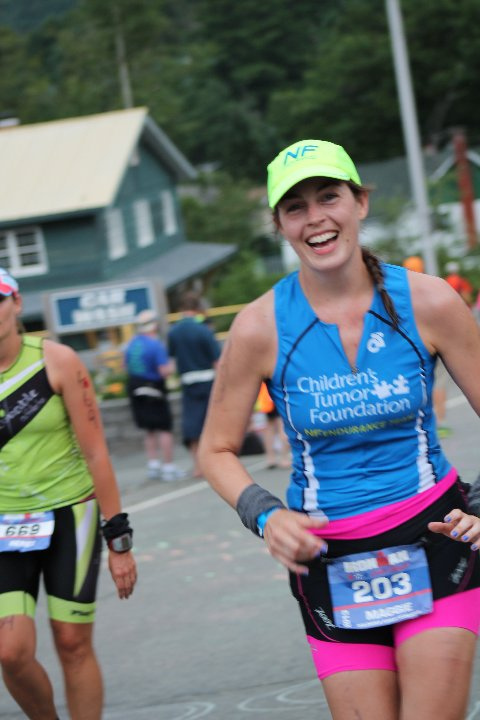 When I crossed the finish line at Ironman Lake Placid I loved my body and my spirit for all that it was capable of. I had forgotten about how I looked in my tri kit – “the bulge” was but a memory by this point. My body morphed into this superwoman creature that carried me 140.6 miles – and that rocked my world. I guess sometimes you have to transport yourself to another superhuman-like planet to start to see yourself in a new light.